Opies Gift Gallery will have new reversible aprons, dish cloths, baby items, Paracord bracelets, Paracord minion key chains, and lots and lots of ties also many other items! Mellander Maple will be bringing their maple syrup and products and Nunda Mustards and Catsups. 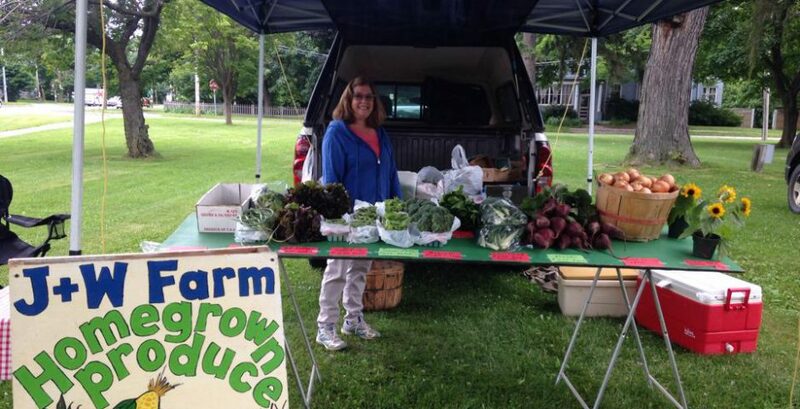 Peg’s Produce will be bringing flower bouquets, lavender, lettuce, beet greens and garlic scapes. Nice Farms will be bringing sweet cherries, raspberries, their own farm raised beef and pork, maple syrup and dip mixes. Phillips Organic will have certified organic rainbow Swiss chard, mixed greens and garlic scapes. Mellander Maple will have their maple products. Also, Nunda mustards and Nunda spicy catsup. J&W Farms will have onions, peas, Swiss chard, asparagus, broccoli. Dave the Honey Guy will have local raw honey and imported coffee bean nut as well as spring and fall allergy honey, creamed honey in cinnamon and apricot, body butter in lilac and unscented and everyone’s favorite honey straws in 30+ flavors. Nice Farms and Opies Gifts will be joining us starting next week. Depending on how the crops are growing more will be joining us as the season progresses. The Woodward Memorial Library will be doing Summer Reading Sign-ups and a craft. See you at the market tomorrow morning!